Finding your best colors : It's So You! My last post was really just a primer for this one. Because it's all well and good if you understand how to coordinate color, or pick colors according to your mood, or even know the most fashion-forward palettes out there. But what really counts is knowing what colors flatter you the most; which make your face glow, your eyes twinkle, and your cheeks color. Your style is truly set back when a good-for-nothing mustard yellow (yes, there are very few people who can pull off this color) contributes to the impression that you suffer from a nasty form of malnutrition or chronic insomnia. In fact, no hallowed shoe or iconic bag or even sparkling jewel can counter the effects of a badly placed hue. 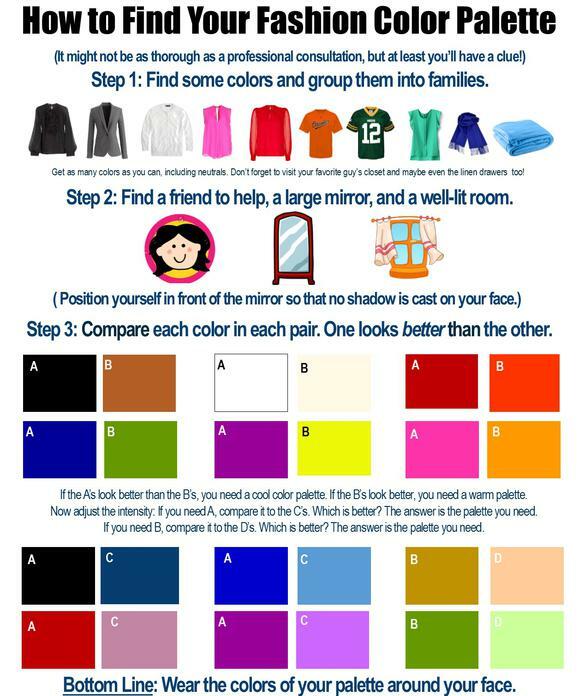 And, of course, the opposite is true as well: An awesome color can make up for anything else happening in an ensemble! I like to call this a "cosmetic" approach to choosing colors. Color placed around the face isn't chosen for a psychological impact or fashion statement (that can be done with the colors placed further away from the face), but for its ability to keep the focal point on your eyes. People will want to look straight at you because they are inspired and captivated. Finding these colors is pretty straightforward. True, a color expert can give you a great range of your best colors more efficiently, usually grouped into categories such as seasons or temperature, and you may have to do a little leg work to follow the do-it-yourself instructions below, but what you'll have in the end is a pretty strong notion of the best colors to choose for makeup, jewelry, blouses, sweaters, jackets, coats, and scarves.